Set within a lovely Art Deco building on Canne's famous Rue d'Antibes, the Best Western Premier® Mondial offers an exceptional setting for your Cote d'Azur vacation. The beaches along La Croisette are just a short walk away. The hotel’s 49 rooms and suites have an air of laid-back elegance, offering free Wi-Fi, iPod docks, minbars, espresso machines and other amenities. Upgrade to a suite for indulgent comforts including spa baths, slippers, bathrobes, terraces and sea views. The front desk staff is at your service round the clock. 17 miles from the Nice Côte d'Azur Int'l Airport. 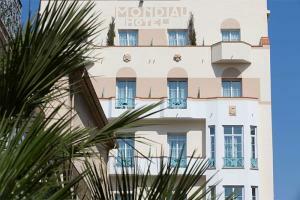 On the famous Rue d'Antibes and near the beaches of La Croisette.